Waiting for the priest. A claim for maintenance. - Barrier Miner , Broken Hill, 29 May 1914, p. 4. Wife or slave? -The Advertiser Adelaide, 23 December 1914, p. 11. The unveiled woman. Jealous Russian husband - Port Pirie Recorder and North Western Mail, 24 December 1914, p. 1. [...] Even less is known about what happened to the family of Bekza Gasieff. He was an Ossetian married to a Russian woman, and they left for Russia in the 1920s. 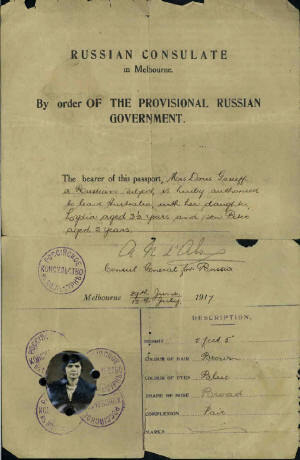 In 1934 Peter Gasieff, his Australian-born son, turned up in India, destitute, where he appealed to Australian authorities after escaping from Russia. Unfortunately, the available documents shed no light on this family's misfortunes.